An Accuweigh forklift weighing system has been fitted to a 12-tonne capacity CAT 150 forklift for the Brisbane-based Hastings Deering. Supplied by Accuweigh’s QWM branch in Geebung, the forklift weighing system was required to provide accurate weights of shipping containers prior to loading onto ships. 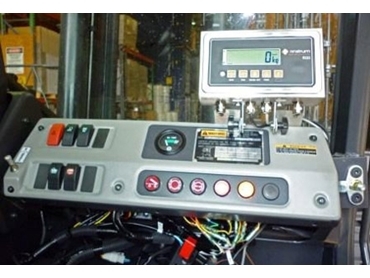 The forklift weighing system fitted to the CAT 150 comprises of a Rinstrum digital weight indicator dash mounted in clear view of the forklift operator. The stainless steel housing and IP65 dust and waterproof rating of the digital weight indicator allows the weighing system to be operated in all conditions. A high quality pressure transducer is plumbed into the forklift’s hydraulic lines to accurately sense hydraulic pressures with an analogue weight signal sent to the digital weight indicator for processing. A printer connected to the forklift weighing system allows weight dockets to be printed for handing out to the truck driver when the containers are taken to the wharf for shipping. Accuweigh has extensive industry experience in the supply of forklift weighing systems and front end loader scales. The company operates eight branches across mainland Australia to provide superior product support on all scales and weighing equipment.